Sunny 16 rule is very helpful if you are going to shot photos with your analogue camera, and have no light meter built in or available. Basically, it says if you set the Shutterspeed to 1 / ISO of your film, and make photos in the bright sun, just go with aperture f/16. Open the aperture by 1 full step for each level of less light. The Sunny 16 App for Android phones does exactly this! 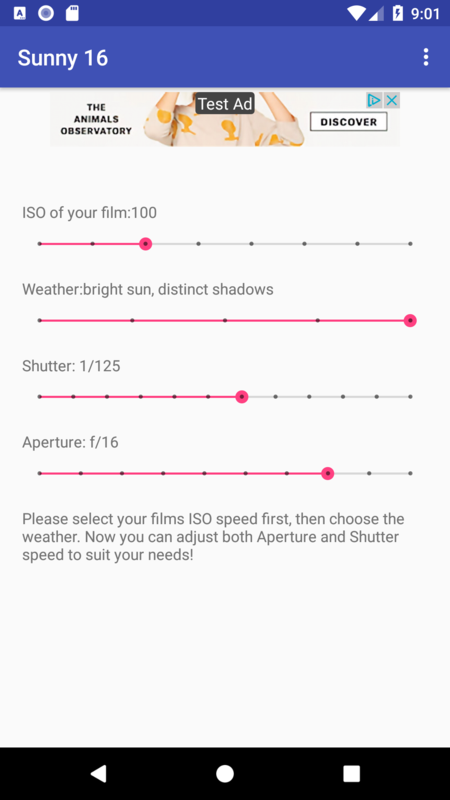 You start with selecting the ISO speed of your film. After this, you select the weather conditions. 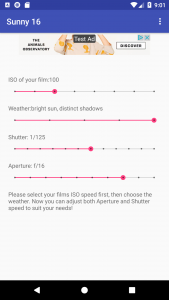 The app tells you now which aperture and shutter speed to use. By moving either the aperture slider or shutter speed slider, you can check out different possible combinations of shutter speed and aperture. That’s it! Sunny 16 is available in English, German, French and Italian. nice article. what the important things on taking a picture use analog for you?